I like yoga, dancing, being organized, drinking coffee, eating peanut butter, working out and being active, the sun, skiing, cooking and baking vegan food, trying new recipes, grocery shopping at Whole Foods, farmer’s markets, going to concerts, tweeting, reading blogs, the city of Chicago, Washington D.C., Hope College, kayaking, watching tennis and baseball, wearing rings on my fingers, learning, driving my Jetta, being studious, new music, clean teeth, wearing warm socks, Gerber daisies, short hair, and summer. I really like being a vegan. I like what making this lifestyle choice has done for my physical health. Eating vegan has enabled me to better care for the body God gave me. Eating a whole-foods, plant-based diet and completely cutting out all animal products has dramatically changed the way I think about, purchase, prepare, consume, and relate to food. I truly enjoy eating, and think about food as nourishing and life sustaining. I like feeling healthy and energized because of my eating habits. I like all the new kinds of foods and different options I’ve tried by breaking away from a more typical diet. Choosing veganism has opened my eyes to different ways of doing things. It’s helped me grow into a woman with strong convictions, who does not sway to all the different pressures surrounding her. It’s given me confidence in making my own decisions and sticking to them. I’ve grown by having to articulate and defend my beliefs and habits to others who do not know about them or understand them. Eating vegan is a very intentional, and sometimes difficult, lifestyle. I like the person I’ve become because I’ve faced the times it’s difficult to be a vegan with integrity and grace. I like that my diet supports sustainability for our environment and is friendly to all of God’s creatures. I like that becoming a vegan has opened my eyes to and given me a passion for the many people in our world who are not abundantly blessed like I am, who have little or no access to essential elements to life, who cannot make choices about what they eat, who have no access to educational resources about nutrition, and who actually go hungry every day. Eating vegan started as something I was going to try for a week or so, but it’s turned into something incredibly valuable and defining. I can honestly call it a lifestyle choice because now I’m vegan for life. I like balance. I enjoy finding balance between the many wonderful things life offers: study, play, work, sleep, community, solitude, eating, resting, learning, moving, etc. I like nurturing intentional and meaningful relationships with other people. It’s important to me to share my life with others. I like to show how I care for other people by taking an interest in them and in what’s going on in their lives. I like to follow up with people after we’ve had a conversation or I’ve learned something that they’re happy about or struggling with or simply going through. I like to remember specific things and ask about them later. It’s one of the ways I like to show my love for other people. I like to make time for other people in my busy life. I like to encourage. I like to use people’s names when I talk to them. I like to be a peaceful and sincere presence in others’ lives. In the same vein, it means a great deal to me when other people act this way toward me. I also really like giving gifts. I like organization, responsibility, and dependability. I value following through on commitments. I have a great appreciation for accuracy and small details. These are some things I like. This post is the complement to my previous one. Rather than examine the big picture, today I want to take a look at the details. Most days, I feel like I’m chipping away at life. And it’s the details of life — my daily to-dos — that cause me to feel this way. A phone call, a bill paid, an appointment scheduled, a friend penciled in, a grocery list written down. Sometimes it’s mundane, like paying rent or grabbing bananas at the store. Sometimes I love the thrill of figuring it all out — changing all sorts of accounts and other documents to reflect my married name. Sometimes it’s plain painful to get through one task — this, for me, would be tracking our spending and budget each month. Most days, I just want to forget all the need-to-be-accomplished things and make cookies, have a glass of tea (or wine), curl up, read a book, and climb in bed. So, sometimes I do. Although I’m really not one to procrastinate, most things on my to-do list can survive waiting a day or two. If I put off shopping, for instance, I can come up with some fantastic dish that I didn’t even realize I had all the ingredients to. If I stay home instead of running to the bank/post office/Target, I can clean. You should know cleaning is my all-time favorite procrastination method. Despite my stall tactics, things must get done. So, I’ve come to appreciate what works for me. • I’m super motivated in the mornings. I try to do some things before I leave for work. I often will make phone calls where I’ll probably be on hold while I’m driving to work. • Lists, lists and more lists. Those three are typically short-term, long-term and groceries. • Prioritizing. I try to do a few of my short-term tasks, which usually are more pressing, each day. Then, when I can, I get to some of the less timely ones. • Break things down. So one perpetual to-do item is finishing our budget from the past few months. I have been working on one month at a time. It’s much less daunting that doing five months all at once. • Have something going on in the background to distract me. This may sound odd at first, but I’m much more productive if I have reruns of a sitcom on the TV. It’s like a little bit of noise makes me zone in. DVDs work well because there are no commercials to annoy me. Sometimes music will do the trick as well. Earlier today I had a thought: There will never be nothing to do. So, I’ll continue chipping away, however slowly it seems I’m going. Oh — the one place there may be nothing to do? Vacation. To unsubscribe from all the emails I don’t actually read. To take time and click “unsubscribe” from any spam that comes in. To let relationships change or even fade. To wear the same type of outfit every day and dress up my layers with one of three scarves that I adore. To read only bound books. I do not want an e-reader. I know my reading habits will morph with any technological shift. For instance, I would very likely start to read books like I read blogs … by skimming and with a lack of solid attention toward them. And that would be bad. To have a not-so-smart phone. Without the Internet. I really don’t want it. I promise. To say no to some things, and to say yes to what really matters. In a quest to live simply, these things and more are OK.
I’ve been meaning to share some photos of what’s been going on in our newlywed rental that we’ve made our own. So, enjoy. To the right is a fun wall-art project I worked on. 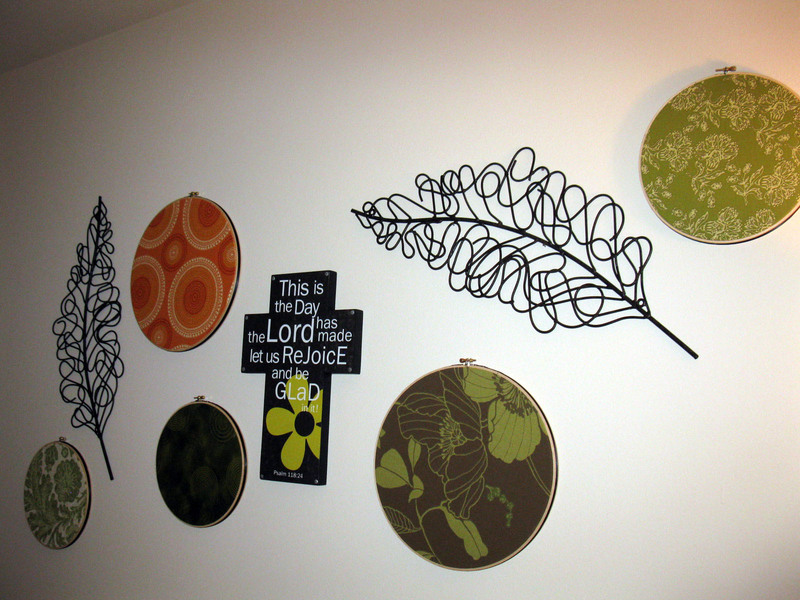 I knew I wanted to decorate with some cross-stitch circles by putting fabric in them. One day while at Hobby Lobby, Nathan and I found the funky leaves. And, the cross is a gift from my mom. Some of the fabric is found elsewhere in our apartment — the green on the lower left is a pillow. The brown and green on the right is also on a cushion on a wicker chair. The other fabrics I found at Hobby Lobby as well. The whole look was super simple — just took cutting fabric and fitting it tightly into the circles. Then, I mapped the pieces out on the floor and transferred them to the wall. So, this is the scene above our black futon. Oh, and inspiration came from here. 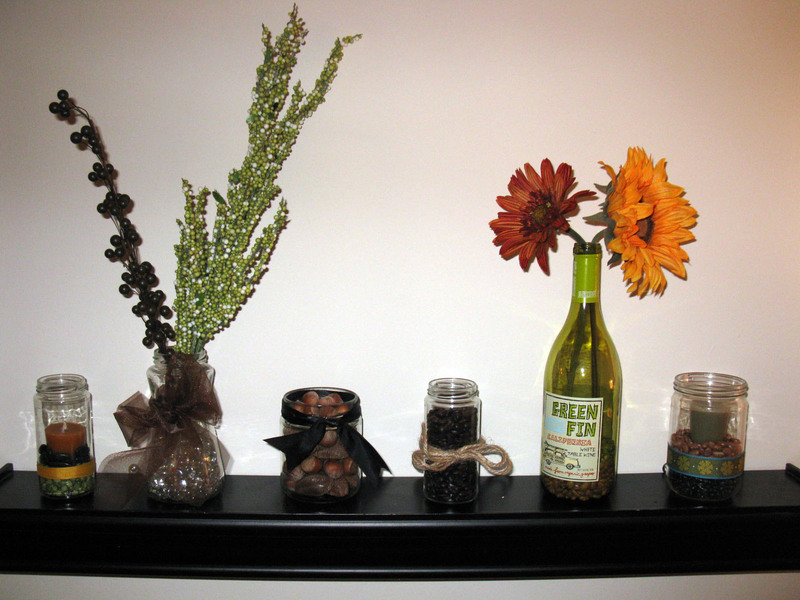 These jars and bottles decorate a little black shelf in our living room. 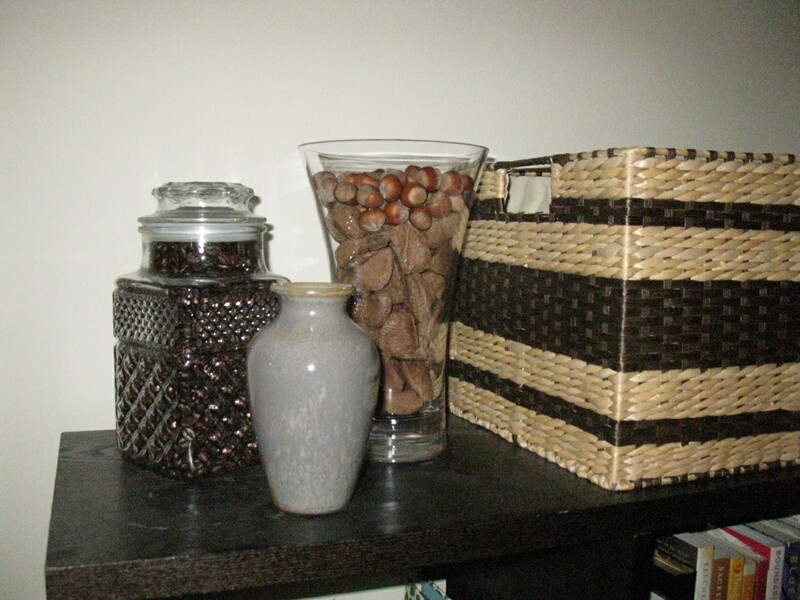 I kind of have a thing for decorating with glass jars, beads and ribbon … plus some tall stuff to add interest. It was also done in my old apartment. Anyway, Nathan put together these jars and beans and glass beads. This is a cheap way to decorate, and it’s super easy to mix up should we crave a little change. This one’s kind of silly. 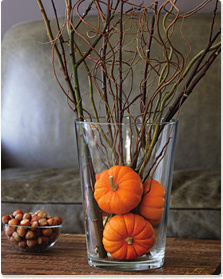 It’s just an example of how I like to decorate with what we’ve got … including whatever fruit we happen to have on hand! In the winter, especially, I like the little touches of citrus that are bright and cheery. 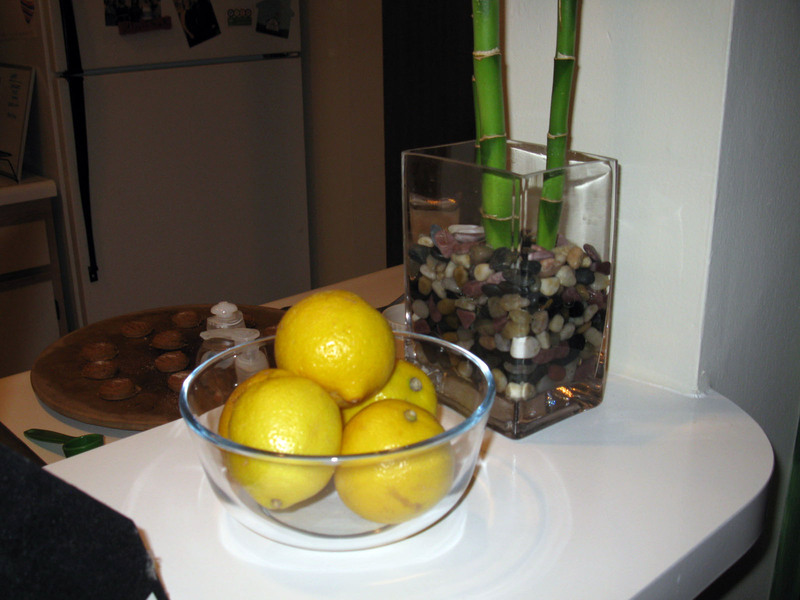 I also enjoy using oranges, pomegranates, potatoes, squash … I think that’s it … to jazz up the kitchen area. Oh, and this sits on the divider between our kitchen and living room. More jars … and coffee beans! And nuts of some variety. I’m not sure what kind. We got the small gray vase and the large flower vase on the right as wedding gifts. The other jar, Nathan has had for a while. I like his jar better with something in it, and in this case, it’s coffee beans. So, I just like this on-the-cheap decorating attempt. This is the top of a bookshelf in our living room. And finally, I’ll talk about the bathroom … which we painted!! 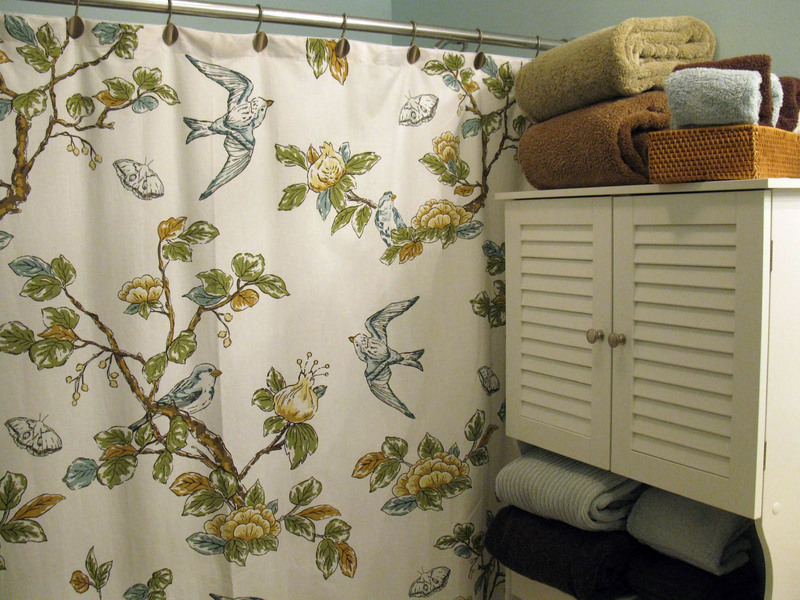 We have birds in the bathroom … and we added a little over-the-toilet storage cabinet to put towels on. But perhaps my favorite part of the bathroom is this little piece (see below) that hangs above a towel rack. 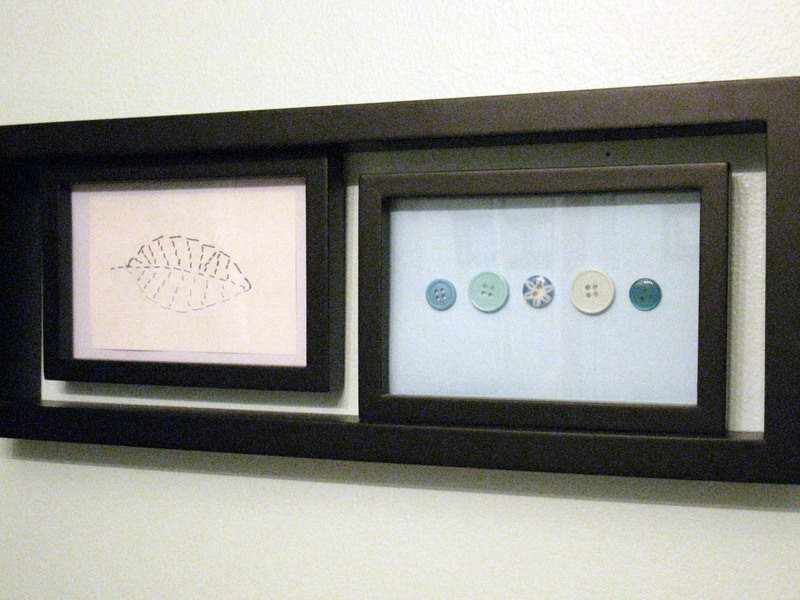 I stitched a leaf onto a piece of paper, and on the right, I just glued blue buttons onto a piece of paper. And, I got this piece of art in the end! It makes me happy … about as happy as the bathroom’s color makes me, which is kind of difficult to imagine with the grainy photo below. Nathan calls it sky blue. So, that’s it for now. I’ll share more snapshots of our place another day. December and an Inspiration Workshop! The advent calendar has two ornaments on it. The tree is up — lights are on, no ornaments yet though. To our delight, we’ve discovered a neighbor family that put up a light show in their front yard synchronized to Christmas music (so cool!). It is definitely December. Nathan puts lights on our little tree. I’ve slowly been working on some personal goals for the month December. They include: Take a photo every day. Write more. Bake. 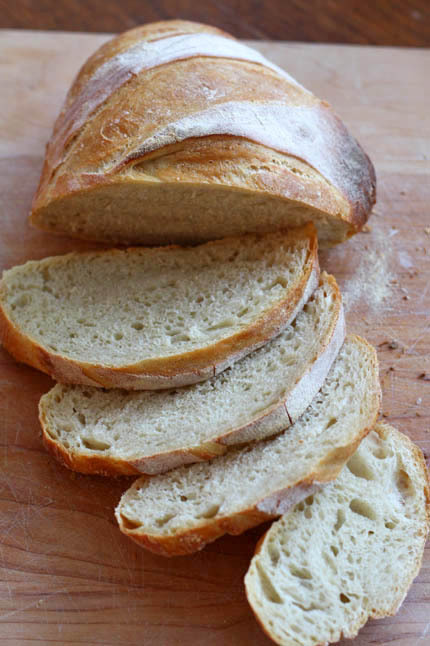 Bake for other people. Enjoy cozy nights at home curled up with a book. Create. Spend time with others. Scrapbook. Oh, and blog. So, here it goes. Why not start with a little prelude to the season and another link-up to Gussy Sews? 1. Take time to do something for yourself. There’s so much going on … only 23 more days before Christmas! Work to do. People to see. Gifts to buy/make. Things I like to do for myself include: yoga, baking, going for a jog, reading, writing, crafting and cleaning — and sleeping! 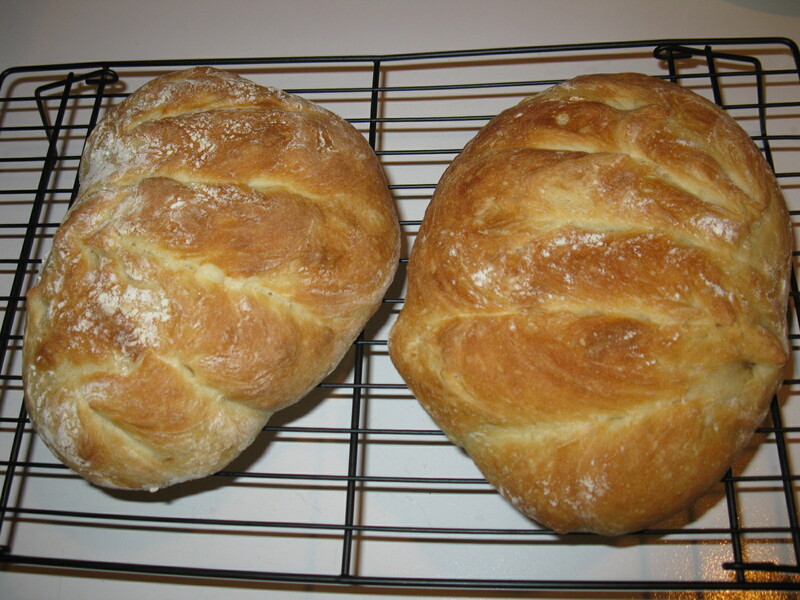 Baking bread is good for me. In the long dark days of winter, I know I get a little moody. Spending some time outside — even if briefly — is so therapeutic. I try to take advantage of the sunshine-y days and take a brief walk or even just stand outside for a little bit. The vitamin D helps a lot. 3. Remember, reflect, refocus and reassess. It’s almost the end of the year. I am thinking ahead to how I’ll spend my 2012 — what goals I have, what I’d like to see happen in my life, and what I want to change or improve on in so many areas of what I do. This helps me keep perspective. And, if I start thinking about these things early, I can start making intentional changes and possibly get a new routine established before Jan. 1. This year, Nathan and I plan to open our stockings on New Year’s Day. This is his family’s tradition. We’ll have my family’s traditional French toast casserole on Christmas day. We have an advent calendar. I’m sure Julie will bring back some of her delicious holiday sweets she’s made a few years in a row for us to enjoy. Maintaining traditions is important to me as it helps bring back the wonderful memories I have. 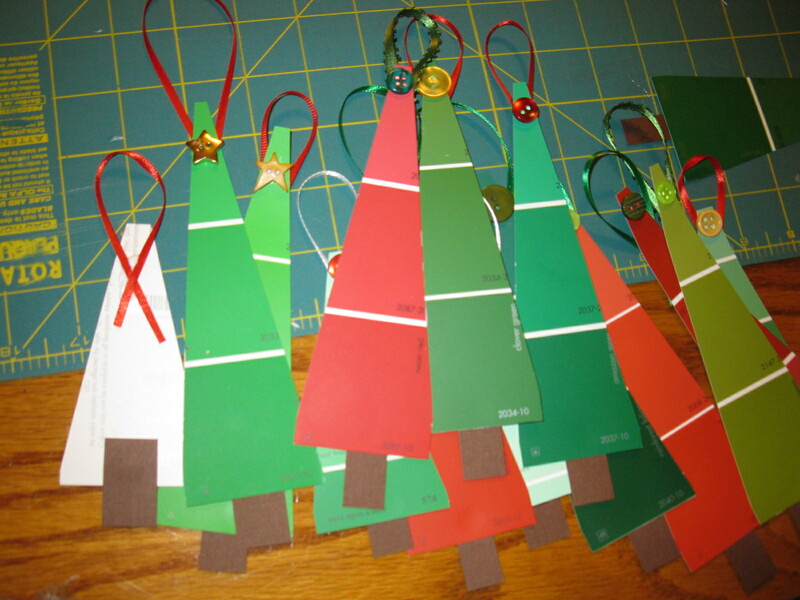 My family made ornaments from paint swatches this year. 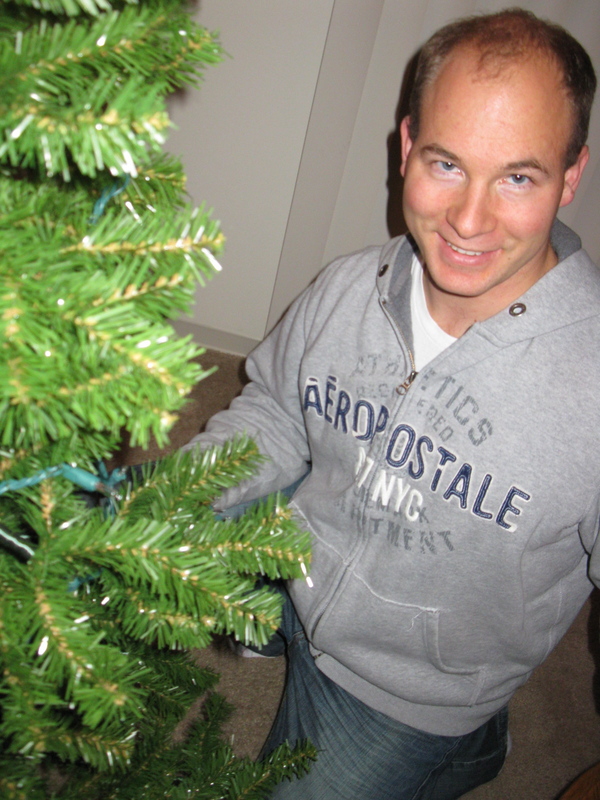 Nathan and I are planning to volunteer together at one of our church’s holiday programs. We’ve been able to enjoy decorating a new place with greens and lights and tinsel and a nativity. Two years ago, Nathan took me on a sleigh ride. Last year, we went downtown Chicago on New Year’s Day for lunch. I’m not sure what else new we’ll do this year … but I’m sure it will be an adventure. And that’s what I enjoy about the new traditions — even if they happen just once. They keep the holidays exciting and create new opportunities to connect with others that we love. 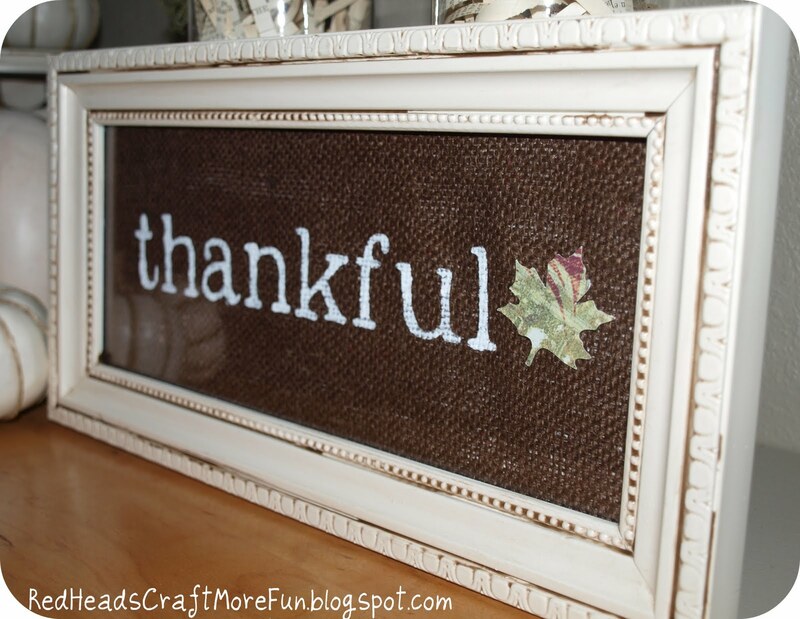 I’ve never done this before, but I totally love Thanksgiving, so I wanted to try this whole Inspiration Workshop that Gussy Sews does! Here goes. 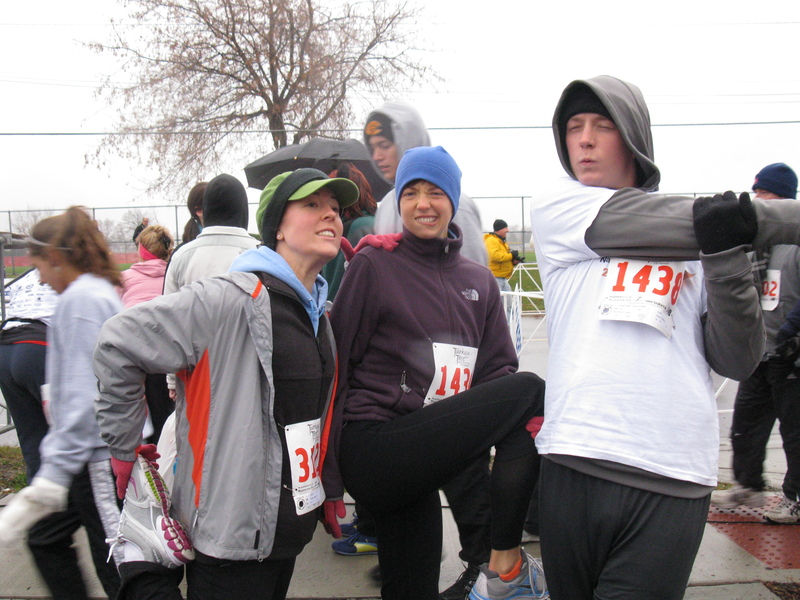 We started a new tradition last year by participating in a 5K Turkey Trot the morning of Thanksgiving. We’re all set to do it again in the chilly temps and then go eat some turkey. This is inspiration from last year! P.S. — this was a super fun little holiday post to do. 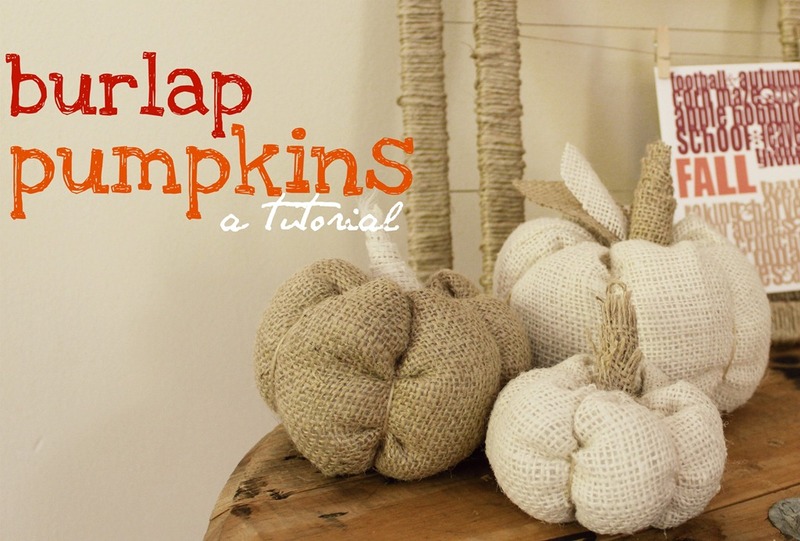 I’m totally hooked on the inspiration link-up … here’s her post!